WatchGuard’s Threat Lab (previously the LiveSecurity Threat Team) is a group of dedicated threat researchers committed to helping you stay ahead of the bad guys by providing in-depth analysis of the top security threats to your network. 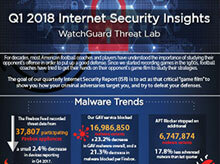 The Threat Lab team analyzes data from WatchGuard’s Firebox Feed, internal and partner threat intelligence, and a research honeynet, to provide insightful analysis about the top threats on the Internet. Their smart, practical security advice contained in the Internet Security Report will enable you to better protect your organization in the ever-changing threat landscape. Stay ahead of the latest security trends and threats! Thank you for downloading the Internet Security Report. Be sure to check back for future quarterly security reports, and follow www.Secplicity.org for daily updates and commentary about the top security industry news, threats and trends.